Linguistics Seminar – Welcome to Cambodia, and….. 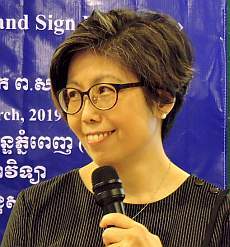 This weekend the Royal University of Phnom Penh in collaboration with the Chinese University of Hong Kong offered a seminar on sign language linguistics. The catalyst for the event and the main speaker was Prof. Gladys Tang, the head of the Centre for Sign Linguistics and Deaf Studies at Chinese University. Click here to see some photos from the day.